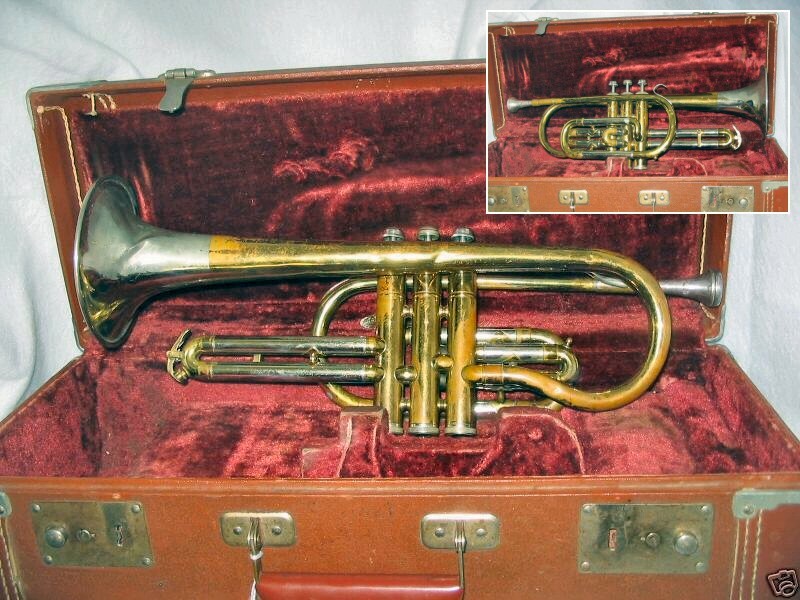 The Roth cornet was originally manufactured by the Ohio Band Instrument Company, a subsidiary of F.A. Reynolds Co. operated by Foster Reynolds, Harper Reynolds and Max Scherl of Scherl & Roth. I have collected advertisements for Roth instruments from as early as 1940; the earliest Roth cornet I’ve noted is SN 22877 (~1941). 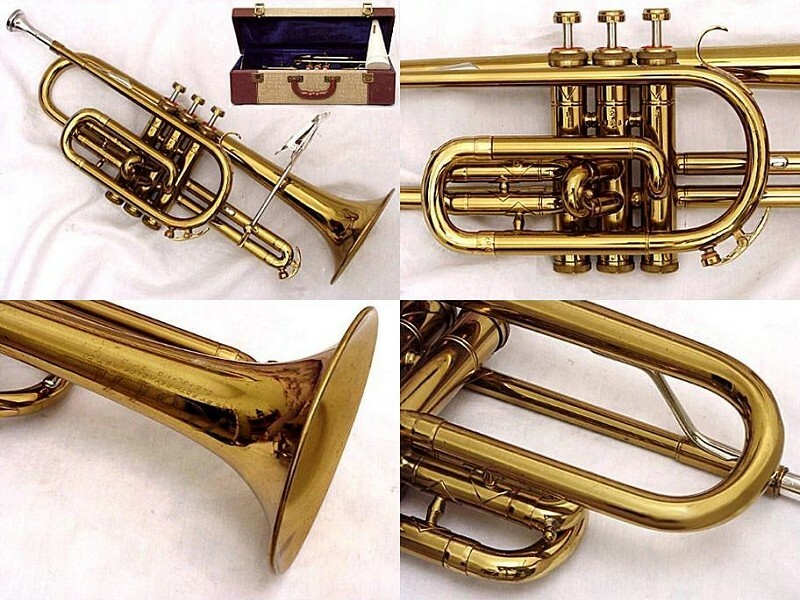 Models produced through c.1949 feature a traditional “Shepherd’s crook” cornet design, where the bell stem tubing is well rounded coming out of the first valve. 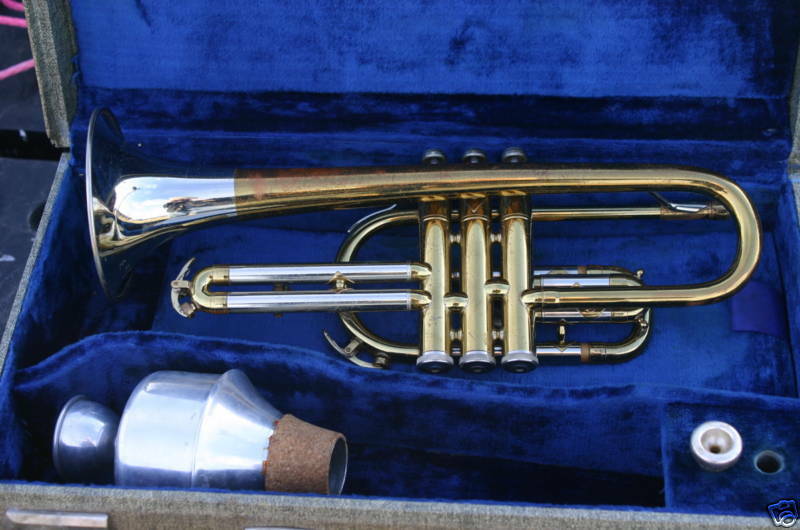 Circa 1949-50, the bell stem design changed to straight trumpet-style tubing. 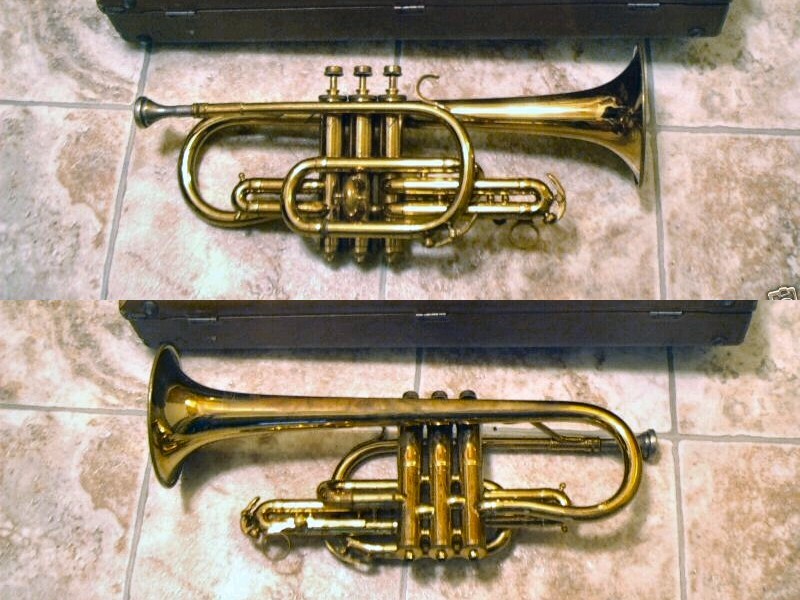 The Roth “Tone Tempered” model with nickel-silver bell flare was introduced in the mid-to-late 1940s, but was soon thereafter designated as the new Emperor model cornet when that model line was launched c.1950. Note: This model has a different main tuning slide wrap style than the later examples below. Note the additional crook to enter from the front on the left side of the third valve, whereas the later horns have a valve entry point on the right side. Roth instruments were manufactured under the Ohio Band name until c.1950 when Scherl & Roth consolidated the Roth instrument line under the F.A. Reynolds label. 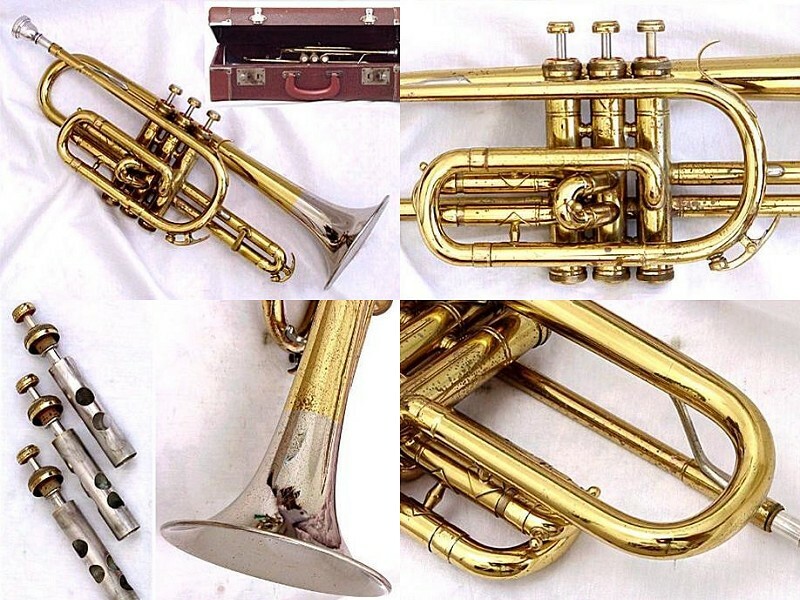 Cornets made between 1950-52 are marked “Made by F. A. Reynolds”. In c.1952, the F.A. Reynolds Co. began operating as “Roth-Reynolds” and cornets are marked as such. Note: Based on the engraving style notes from the owner, the example photo at right appears to use a Reynolds serial number vs. Roth numbering; approx. 1952. Compare to “Tone Tempered” model, SN 45093 (above). 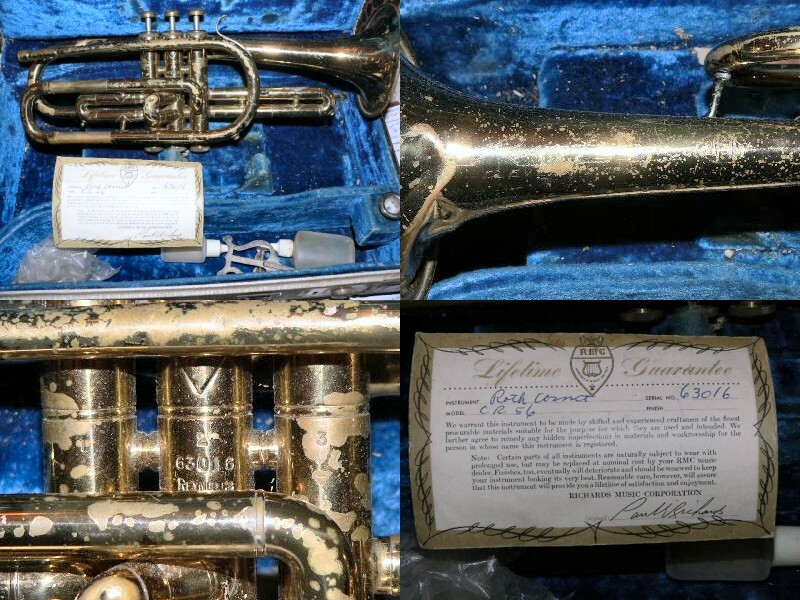 Note: Based on the RMC documentation and engraving style, this cornet appears to use a Reynolds serial number vs. Roth numbering; approx. 1961. 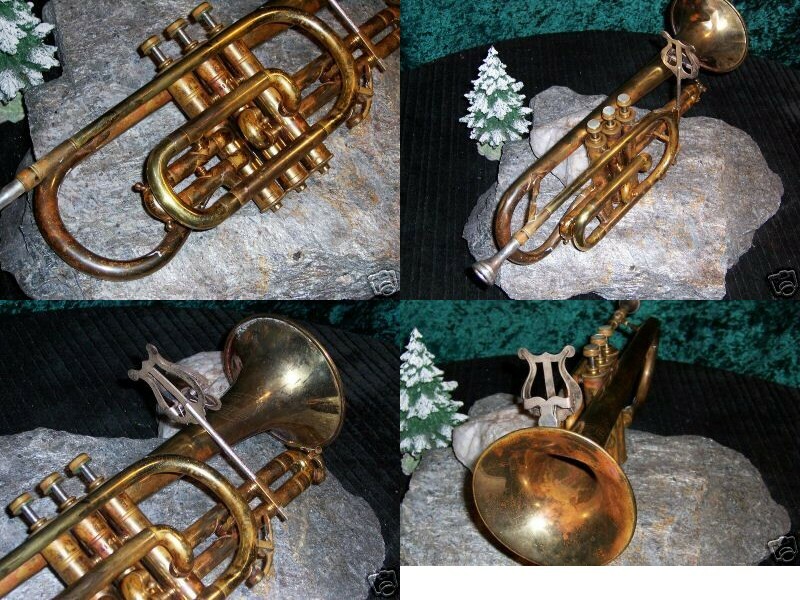 Roth Trumpets and Cornets – the greatest value in band instruments today! Designed to guarantee maximum quality at a minimum investment. Carefully made and modern in design, this model is ideal for student musicians. Hand-lapped, nickel silver pistons for years of service. Ease of blowing means young musicians will learn quickly, play proficiently and enoy their instrument. Durable brass with clear lacquer finish and complete with new design trunk style case and special fittings. Roth is the cornet of quality most widely used in schools today. It embodies all of the fine workmanship of our craftsmen yet is extemely low priced. Special bore and taper designed for easy blowing so the student will learn quickly and thoroughly enjoy his instrument. Hand-lapped nickel silver pistons, durable construction, beautiful lacquer finish. Complete with Gladstone case and special fittings.